This week we'll take a look at three games that are in the early-release stage and show a lot of potential. 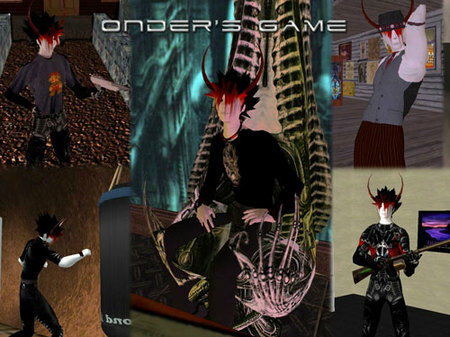 We're on the cutting edge of what's new and exciting in Second Life games here. These are games that either have just been completed or, in one case, aren't even available to the general public yet! Join me as we shoot some ducks, play a giant board game, and a trip to the Wild West! 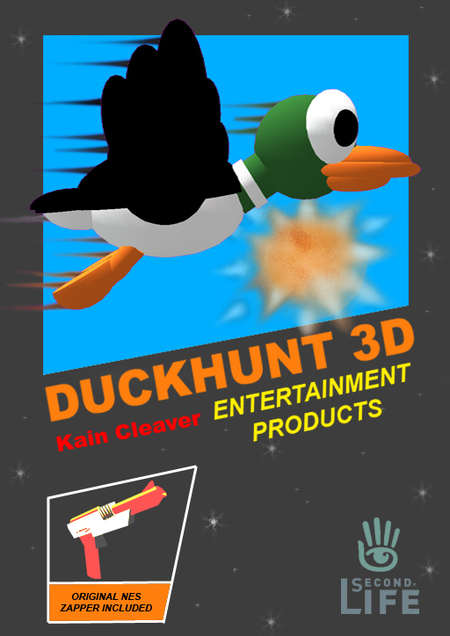 Gameplay: Shoot those ducks or suffer humiliation from a laughing dog. Current Shortcomings: Need to build your own walls around it, limited signage, very hard game. Where to Play/Buy: I'm running a copy at the Games Park , and you can purchase at SLX. Kain Cleaver, who previously brought us the brilliant Mario Kart Kit, has done it again. 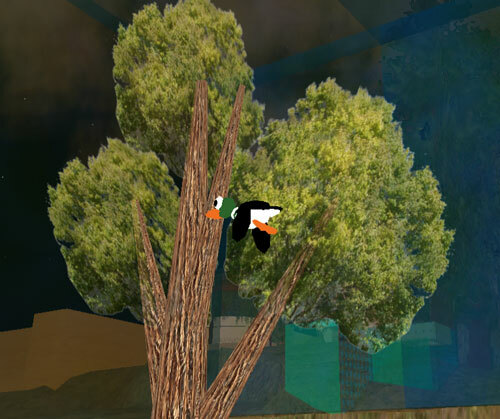 Duck Hunt 3D is a rendition of the classic Nintendo game that remains faithful to the original while moving things into the third dimension. The package includes five different versions of the game depending on how much you want to charge to play. (I put the cheap L$10 version in the Games Park.) Installation is simple - just drag it out of your inventory and it rezzes fully functional. There's a high score board, the sign distributes a simple Nintendo Zapper, and one-click interface to get the game started. Players can win one of 16 prizes including t-shirts, trophies, and a fully functional 2D version of Duck Hunt. The first thing you'll notice is the sound. The startup music, the "flapping" sound of the ducks, and laugh of that stupid dog are all there rendered perfectly. The second thing you'll notice is that this is a pretty hard game. There's a delay between when you pull the trigger and when your shot hits the target, so you have to lead the ducks a little. Those ducks don't stay still! Players can use their own guns, but I'm pretty sure my neighbors would freak if they had to deal with the sound of machinegun fire all day. So you're using the Zapper provided (which looks great, by the way), when green text starts scrolling at the bottom of your screen letting you know what parcels you're banned from. Apparently the shots from the Zapper don't stop at the edges of the game but just keep going and going. I built some walls around my installation, but I really do wish there had been some mention of this before I set it up and went trigger happy! This is a hard game, no doubt, but may be worth it. After I got past the initial hassles I started to have a lot of fun with this. There's a severe lack of one-player shooters in Second Life, and this does a good job at filling the gap. Besides, the prizes are killer! Gameplay: Get all of your pieces around the board while sending your opponents home. Where to Play/Buy: ONLY at the Games Park, not even available for purchase yet. IM Monk Zymurgy for a copy! A functional HUD version of the classic board game Trouble would be reasonably fun. A physically rendered version with moving pieces, a working dice popper in the middle, and user friendly interface would be even better. A huge version with pieces so big you can ride them around the board, however, takes things to a completely new level. 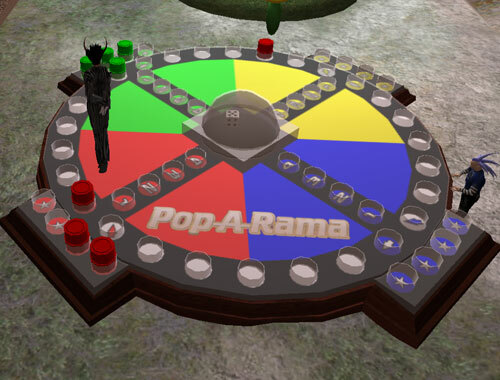 For those who aren't familiar with the game, players push on a "popper" in the middle of the board to roll the dice. They can then move their pieces around the board that many spaces, and send their opponents back to the beginning if they land on them. It's a pretty simple concept, but since all players have four pieces there's a bit of strategy as to when to move which piece on each roll of the dice. Monk Zymurgy almost didn't even finish "Pop-A-Rama". He put it together on a whim and was testing it in the sandboxes of Discordia. A few of us helped him test it out, and I made a note to follow up with him on it later. When I eventually asked him about it he said that he was thinking about never finishing work. Aghast at the prospect of such a great game disappearing, several of us banded together and begged him to put an installation of it in the Games Park. He gave in and a few of us got together for a rounds or two. Apart from some lag issues the board works very well. The popper even has a failsafe so that if somebody does something sneaky to the dice you can re-rez them and just keep on playing. That came in handy at one point when a passing vehicle smashed into our board. Only in Second Life! Just before publication of this article I checked back in with Monk. Not only has he been spending time streamlining the code, but he's going to be releasing an auto-updating version of it on SLX soon. Usually an auto-update feature just means that you get bug fixes and minor tweaks, but Monk is taking it to the next level: the board will eventually be able to morph into entirely new configurations! Gameplay: Roleplay living in the Old West, with a very quick and simple shooting interface for those intense moments. Top Qualities: Great costumes, great guns, and really great role-players. Current Shortcomings: Only a month old, so there are areas of the sim yet to be built upon, bare rooms in some of the buildings, and it's busy only certain times of day. Tombstone is a labor of love from Kasandra Milland, sim owner and 1800s aficionado. Only a month old, it already boasts a small town, Indian village, several shops and a decent number of regular visitors. If you're into the Wild West, this is the place for you! Recently I brought a few friends to Tombstone to get the outsider's perspective. Now, granted, I didn't exactly blend with the crowd, but Kristofer's cowboy squirrel turned a few heads too. The locals were friendly, however, and were good enough to point us in the direction of the General Store where we could get our hands on some reasonably priced costuming. Well… Kristofer did. I figured I'd role-play the devil comin' down to Georgia. The combat system is as easy as it gets. Equip the HUD and a gun and you're all set. Gunfights were straightforward, and when you die just click on the HUD to come back from the dead. The guns themselves work remarkably well with no lag that I could detect, bullets hitting home as soon as the hammer falls. The best part is the price: you can start with the L$100 basic set and just upgrade your gun for looks later. Under these circumstances, obviously, role-play becomes very important. 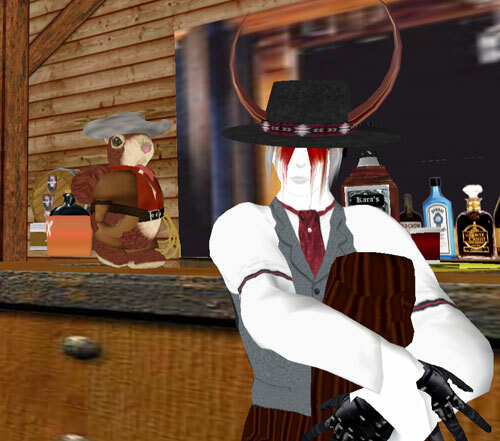 Most we encountered were very good about working our bizarre appearances into an 1800s context until we could find our feet, which is more than you can say for many of the more strict role playing environments of SL. A typical player will adopt the role of sheriff, ranch hand, nurse or outlaw. There's even a Doc Holiday and Wyatt Earp in town. Mornings and mid-day are pretty calm with most people working on their homes or hanging out, followed by a bank robbery with the inevitable fight with outlaws. In the evening the saloon gets packed, there's drinking, dancing and music, and of course a few disagreements that get settled with a shootout. There's even Sunday service with Father James! The sim is already breaking even between home rentals and the riverboat casino, so expect Tombstone to keep growing from here. The friendly atmosphere of this duty western sim will draw us all back for some time to come.